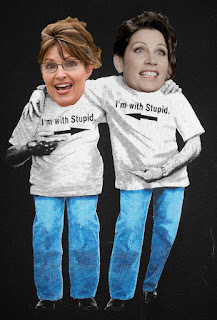 Sarah Palin and Michele Bachmann have been touring the country, not sure why really, except to work up the frenzied base and see if they can get any more people killed. Their tour consists of appearing before screeching, rabid fans by day and cuddling up in penthouse suites by night to paint each other's toenails. Here's a rundown of the tour from a cuddly lesbian: http://www.youtube.com/watch?v=x2QZiTVsbkM Oh, and if you need to laugh for a while, and then cry, there's this: http://wonkette.com/tag/pt-scissor-me-timbers/ Oh, to be a fly on the wall, or the bumpit in Palin's hair! This woman. I could go point by point with individual issues that are serious problems with Palin, but the common theme is that she is the modern symbol of anti-intellectualism. She represents fear and brazen rejection of education, and pride in fundamentalist dogma. I'm sure this is preaching to the choir here. But as much as I'd love to discount the woman and let her go back to populating the northern part of the country with little Truks and Lugz and Talladegas, there are too many people---people I know, in fact---who not only don't find her batshit crazy, they agree with her. They like her. Back when it was first announced that she would be McCain's running mate, I remember asking my mom (a Christian conservative) one day what she thought of Sarah Palin. She smiled at me and said, "I think she's gonna win it for the Republicans!" That kind of blatant disconnect with reality is prevalent around here. She also made the really awesome suggestion that Obama haters, when they see stupid commie douchebags driving around in their fuel-efficient cars with their Obama stickers, to go yell in their faces and start political arguments in the middle of traffic. What a real American! Sarah Palin loves to be divisive; when I watch video of her running through her zingers, you can see the glimmer in her eyes. She was a Mean Girl in school for sure, snarking on freshman thighs and delivering fatal one-liners in her now infamous nasal honk. She lives for getting in front of a crowd and really giving it to those gosh-darn liberals. I'd love to see her actually talking with people who don't support her---you know, fake America, gay people, poor people, anybody who's not white, anybody who's not a Republican, people who don't shoot things, etc. Now that would be good teevee.